But what if I were to tell you it didn’t have to be this way, and that instead of filing for bankruptcy, these governments could all wipe out their debt, pay their bills, continue to employ their workers, and eventually minimize and eliminate the need for taxes? People are saying that Detroit doesn’t have the $3.5 billion to pay its former government employees — teachers, firefighters, police and more — BUT IT DOES!!!! How is that possible? It’s a little known fact that governments are not just using your taxes to pay for government services, they are also investing your taxes in businesses all around the world, and making millions of dollars. Like big banks, they use your hard-earned money and invest it elsewhere to accrue interest over the years. Although the evidence for these funds is posted on the Internet annually, the mainstream media has colluded for forty some years to keep this quiet. 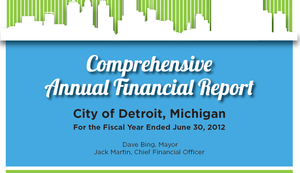 All municipalities, including Detroit, have two sets of accounting books — one is the public operating budget that you and I hear about, and the other is this investment fund. The key to paying workers and supporting our communities is in the second set of private books…there are literally trillions of dollars available in these government investment funds that were set up for “rainy days” and could be used to balance government budgets, and even have a surplus. These reports can be discovered in what are called CAFR’s — Comprehensive Annual Financial Reports — that reveal the existence of trillions of hidden dollars across the United States. You can learn more about CAFR’s in my previous blog. CAFR’s reveal that not only is there money available, but there is big money available in nearly every major city. For example, the small city of Stockton, California had at least $208 million in liquid investments when it filed for bankruptcy and in 2012 the “failing” state of California had $755 billion in its “rainy day” CAFR fund. Here’s an example of this type of deceptive accounting from Detroit: on page 41 of Detroit’s CAFR it lays out the scam in its “Statement of Net Assets”. The gist is that the City declares over $10.6 billion in “liabilities”, which it then “balances” against about $10.3 billion in “assets”. The trick used has to do with timeframe for the accounting. The government counts in the present all the money they will owe on contracts and pensions, so instead of amortizing the liability over the many years that they have to pay it, they instead count it all as due right now. Not only does this mean the government does not get to include any offsetting revenue that could be used to defray those costs, like fees and taxes collected in that timeframe, it also forces a negative balance by lumping all liabilities as due in the present when this is simply not the case. It would be like you adding the total cost of your mortgage in your yearly expense column. In Detroit, this results in a “balance” that gets shown to the people as a negative $300 million dollars. But $9.1 billion of that is not due until sometime in the future — at the rate of about $300–400 million per year. So the $10.3 billion in assets that are real right now for Detroit could be used to rectify the situation and take care of human beings rather than be squirreled away for the politicians and bankers. There is no evidence that this will stop until we stop them. There’s talk of Obama now bailing out Detroit…with more of your tax money! And then what happens with the other cities? If Washington bails out the cities, who is going to bail out Washington? Can you hear the rattling of more debt chains coming — for you and your children’s children? People talk about government “incompetence” in this type of situation, and “fiscal irresponsibility.” This is not ignorance or incompetence. This is blatant fraud. Publicize the truth of the money available. Put the money to work for the people who funded it — that’s you! Use the millions and billions in the government’s true asset funds as an endowment for the community. Replace taxation with this investment fund as the source from which to meet community needs. Burien calls this approach the “TRF” — Tax Retirement Funds — because that is just what they do: phase out and terminate the need for taxes. Does all of this sound impossible? For a glimpse at a similar scam — a tip of the iceberg, check out the California state parks department getting caught just last year with $54 million squirreled away while claiming they needed to close parks. Please help spread the word, demand truth from your representatives and press your local papers or radio and TV channels to cover this. You can access state CAFR reports here. We also encourage you to sign up in our Solutions Hub — simply click on “Find a Group” to search for others in your area who may be interested in working with you on CAFRs. If there aren’t any people listed in your area, consider registering a new group and make sure to list “CAFR” as your group focus. We will be updating the Solutions Hub to be more effective in the coming year — for now it can be a useful resource to connect with others. Let’s take this tragedy and use it to inform how to take our power back!